Solteritas, which I guess would translate to “young or little single ladies” (??? 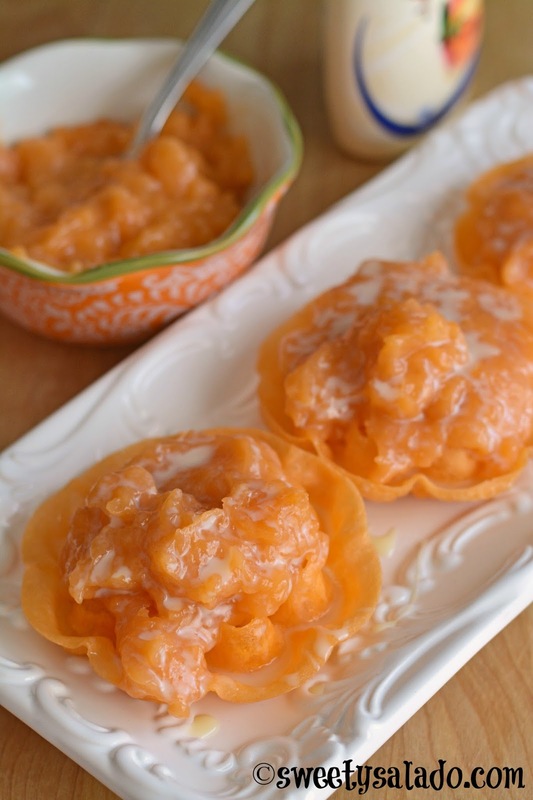 ), are sweet, crunchy, orange cookies that are sold in Colombia with a sweet cream of the same color. For the longest time I thought that it was pastry cream, but it turns out that it’s simply a sweet cream made out of flour that goes really well with the cookies. These cookies are sold everywhere, but I have seen them mostly sold at neighborhood parks and at school entrances. 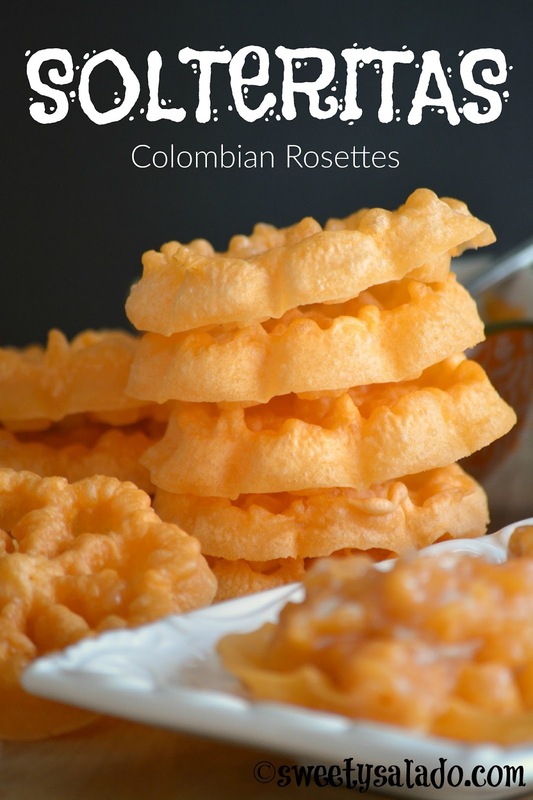 And just like many other sweet Colombian recipes, they are very, very popular. Believe it or not, these cookies are not Colombian. In fact, they’re called “rosettes”, which are Scandinavian cookies that are covered with powdered sugar and are traditionally made during Christmas. They’re delicious when eaten all by themselves, but in Colombia we always have to change and exaggerate things to our own taste. 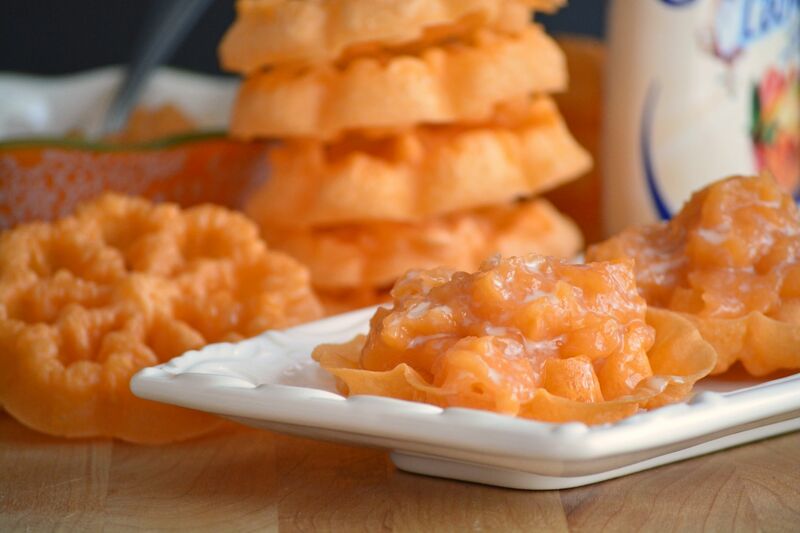 So, we use the traditional recipe to make the cookies, we add the orange coloring and then to top it off, we serve them with a very sweet cream. The rosette iron mold is not that expensive and you can find it at most stores where baking gadgets are sold or even online, which is where I found mine. And just be really patient when you make them because they can be tricky. But after you make about 5 or 6, you will get the hang of it. To make the cookies, beat the eggs with the sugar and salt in a large bowl. Do not over beat so the cookies don't bubble up too much while frying. Add the rest of the cookie ingredients until they're well incorporated. The amount of food coloring depends on how orange you want the cookies to be. Cover with plastic wrap and refrigerate overnight. The next day, stir the batter once again before frying the cookies. To make the sweet cream, sift the flour into a medium bowl and mix it with 1¼ cup (300 ml) water. Add the vanilla or banana extract and the food coloring. Again, the amount of food coloring depends on how orange you want the cream to be. Mix until everything is well combined and set aside. Now, boil 1 cup (240 ml) of water on high heat, then add the sugar, reduce the heat to medium low and stir until it dissolves. When the sugar has dissolved, slowly add the flour mixture and stir until you end up with a thick, smooth cream. Remove from the heat and let it cool completely. Pre-heat the oil at 350ºF (180ºC). Dip the rosette iron in the oil for about 30 seconds to warm it up. Lightly blot off the excess oil on paper towels and then dip it in the cookie batter. Do not let the batter go over the sides of the iron. Now, dip the iron with the batter in the hot oil and let leave it there for about 30 seconds. If after that time the batter does not come off the iron by itself, you can pull it off with the help of a knife. Fry each cookie for about 2 minutes, then let drain upside down on paper towels and let them cool completely. To assemble the cookies, spread about 1 or 2 tbsp of cream on each one and drizzle with condensed milk. Just had these for the first time, we're visiting relatives in Pereira and someonee brought these over. Thanks for posting this!